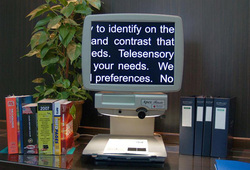 Thanks to the generosity of Library Board Secretary Claire Beslow and her husband Edward, the library received the donation of a Telesensory Machine with a 19-inch monitor, which magnifies printed text for the ease of reading by patrons who are visually impaired or who just need extra help. We invite anyone who may need such assistance to visit the Library and use the machine, which sits at the end of the row of computers on the lower level of the Library. An unexpected benefit to our community is that Borough Archivist George Carter has found the machine to be of use in deciphering the handwritten Chapin letters on which he and his interns have been working in the Local History Room.